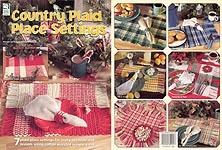 Country Plaid Place Settings, designed by Maggie Petsch Chasalow, House of White Birches, 1999. 7 plaid place settings for every occasion and season, using cotton worested weight yarn. New, but may have faint odor of cigarette smoke. 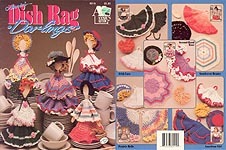 Annie's Attic Dish Rag Darlings, designed by Annie Potter, Annie's Attic, Inc., 1992. Five delightful folk-art dolls whose outfits each include three or four different dishcloths or pot scrubbers, modelled on a wooden spoon! Practical kitchen decor that's sure to bring a smile. Like new -- may have a very very faint scent of fabric softener sheet. 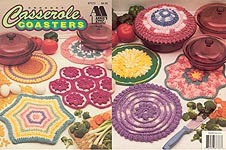 Annie's Attic Crochet Casserole Coasters, designed by Deborah Levy-Hamburg, Annie's Attic, Inc., 1993. 8 different casserole-size hot pads worked in cotton worsted yarn. 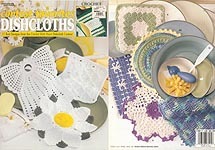 Patterns can also be used for potholders by substituting cotton sport-weight yarn. Like new -- may have a very very faint scent of fabric softener sheet. 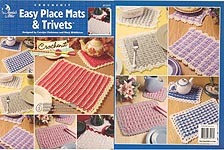 Annie's Attic Crochenit Easy Place Mats & Trivets, designed by Carolyn Christmas and Mary Middleton, Annie's Attic, 2002. 6 pairs of colorful reversible trivet / place mat sets made with cotton or worsted yarn, Excellent condition. 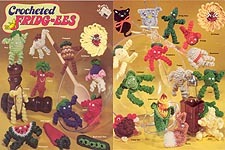 Crocheted Fridg-ees, designed by Faye W. Hays and Ora Hedgepeth, Harold Mangelsen & Sons, Inc., 1985. Over two dozen clever designs, including assorted fruit and veggies with curly arms & legs and google eyes, sunflowers, a bunny, a kiten, an owl, and a turkey pair. Sure to make you smile! May have store sticker or price tags on cover, but otherwise very good condition. 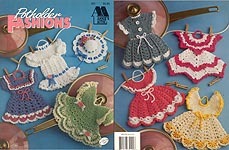 Annie's Attic Fridgie Frocks, designed by Annie Potter, Annie's Attic, 1993 10 cute designs made in size 10 crochet cotton. Like new, but may smell "perfumey." Annie's Attic Crochet Flower Potholders, designed by Annie Potter, Annie's Attic, 2000. 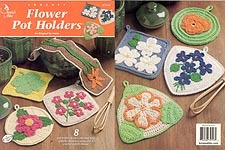 8 pot hodler designs adorned with colorful blossoms using size 5 crochet cotton. Excellent condition -- some spine wear, smudges from price tags. 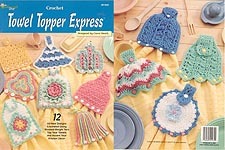 Crochet Towel Topper Express, designed by Carol Smith, The Needlecraft Shop, 2000. 12 designs crocheted using worsted-weight yarn. Some shelf wear on edge and spine, but otherwise excellent condition. 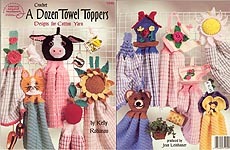 A Dozen Towel Toppers, designed by Kelly Robinson, American School of Needlework, 1997. Twelve designs for cotton yarn, include Cow, Rose, Cat, Sunflower, Apple, Bear, Rose Teacup & Tea Pot, Pansy, Birdhouse, Daisy, Rose, and Ruffles. Excellent condition. 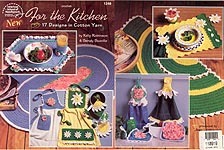 For The Kitchen, designed by Kelly Robinson & Sandy Scoville, American School of Needlework, 1997. 17 designs in cotton yarn include Rose and Daisy aprons, pot holders, glass cozies, dishcloths, coasters, place mats, napkin rings, towel toppers, and rugs. Very good condition. 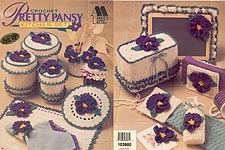 Annie's Attic Pretty Pansy Kitchen Set, designed by Maggie Weldon, Annie's Attic, 1994. Includes: Canister Set, Napkin Holder Cover, Toaster Cover, Memo Board, Soap Dispenser Cover, Place Mat & Napkin Ring, Towel Holder, Pot Holder, Jar Cover, Utensil Holder, and Fridge Magnet, all worked in worsted weight yarn. Like new -- may have a very very faint scent of fabric softener sheet. 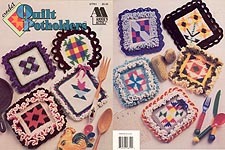 Annie's Attic Crochet Quilt Potholders, designed by Mary Layfield, Annie's Attic, 1994. Worked in worsted weight yarn, designs include: Old Maid's Puzzle, Grandpa's Favorite, Arkansas Crossroads, Sunflower, Goose on a Pond, Tippecanoe, Scrap Basket, Windmill, and Ribbon Star. Like new. 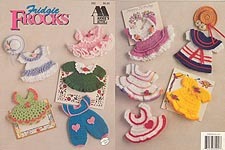 Annie's Attic Potholder Fashions, designed by Annie Potter, Annie's Attic, 1993 Made in sportweight cotton yarn, these seven pretty dresses and one hat can serve as toys, potholders, or kitchen decor! Former owner's name written cover as well as blacked- out address label, but otherwise like new. May smell faintly of cigarette smoke. 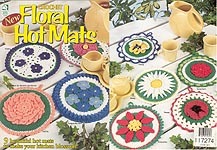 Floral Hot Mats, designed by Rosetta Harshman, House of White Birches, 1997. 9 beautiful hot mats worked in 4-ply cotton yarn: Violet, Rose, Dahlia, Forget-Me-Not, Pansy, Geranium, Poppy, Daisy, and Poinsettia. Like new. 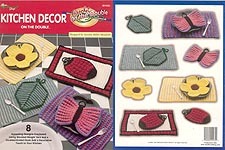 Contest Favorites Dishcloths, Leisure Arts, 2000. 17 best designs from the Crochet With Heart Dishcloth contest. Very good condition, but very faint smoky smell. 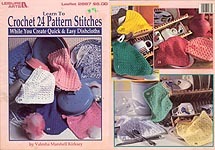 Crochet 24 Pattern Stitches While You Create Quick & Easy Dishcloths, designed by Valesah Marshell Kirksey, Leisure Arts, 1996. The title pretty much says it all! Like new, but may smell slightly of dryer sheet. Annie's Attic A Dozen Doily Dishcloths, designed by Annie Potter, Annie's Attic, 1993 Made with sportweight cotton yarn or a double strand of bedspread-weight crochet thread, these practical floral dishclothes will also brighten your kitchen. Like new -- may have a very very faint scent of fabric softener sheet. 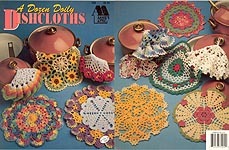 Annie's Attic Perky Potholders, designed by Eleanor Pool, Annie's Pattern Club, 1985. A variety of potholders and ovem mits, plus a recipe holder, crocheted in worsted weight yarn and decorated with cross-stitch. Very good condition. 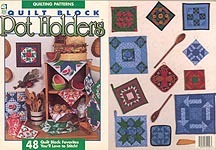 Quilt Block Pot Holders, House of White Birches, 1995. 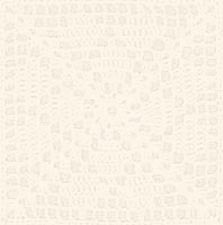 QUILTING PATTERNS for 48 favorite blocks and instructions for creating one- of- a- kind potholders. Excellent condition. 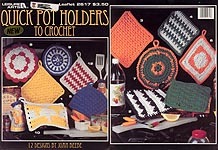 Quick Pot Holders to Crochet, designed by Joan Beebe, Leisure Arts, 1994. 12 designs in cotton worsted weight yarn. Some cover wear and address label with former owner's name crossed off on front cover, but overall very good condition. 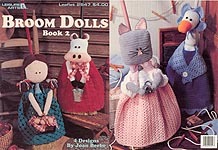 Broom Dolls, Book 2, designed by Joan Beebe, Leisure Arts, 1994. Four designs in worsted weight yarn include: Doll, Cow, Cat, and Goose. Light pencil marks to keep track of rows on two patterns. 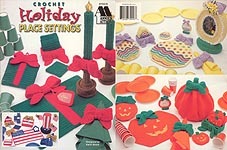 Crochet Holiday Place Settings, designed by Karin Strom, Annie's Attic, 1998. Absolutely amazing Christmas, Patriotic, Easter, and Halloween place settings each include: A centerpiece, placemats, pot holder/ hot mats, coasters & holder, place card holder, and napkin ring bows. Excellent condition. 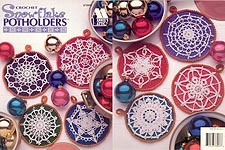 Crochet Snowflake Potholders, designed by Ann Kirtley, Annie's Attic, 1995. 8 designs in 3 sizes; back and edgings are crocheted in worsted weight yarn; snowflake designs are size 10 crochet cotton. Like new. Kitchen Decor on the Double, designed by Sandra Miller- Maxfield, The Needlecraft Shop, 2000. 4 sets of matching placemats & pot holders using worsted weight yarn and a double- ended hook: Sunflower, Leaf, Ladybug, & Butterfly. Tags on cover, but otherwise like new. 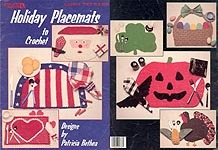 Holiday Placemats to Crochet, designed by Patricia Bethea, Leisure Arts, 1989. Unique shaped designs for placemats & matching napkin rings for Valentine's Day, July Fourth, Easter, Thanksgiving, St. Patrick's Day, Halloween, and Christmas. Some cover & corner wear; otherwise, good condition. 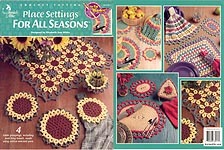 Place Settings for All Seasons, designed by Elizabeth Ann White, Annie's Attic, 2002. 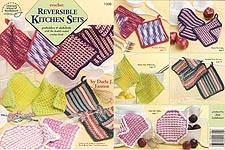 4 sets, each including Place Mat, Pot Holder, Towel Topper, Hot Pad, and Glass Holder, crochet with cotton worsted yarn. Excellent condition. 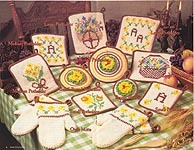 Reversible Kitchen Sets, designed by Darla J. Fanton, American School of Needlework, 2003. 5 potholder / dishcloth sets crocheted with the double-ended crochet hook. New.